The cat is out of the bag and here is everything we know about the Tata Harrier. 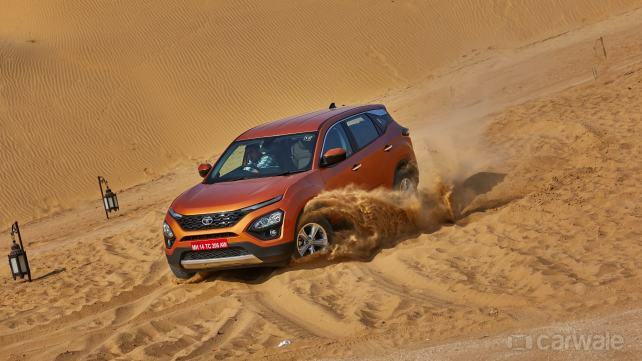 Arriving in January, the Harrier will be a feature loaded SUV from Tata’s stable and a good looking one as well. It is expected to be priced in the range of Rs 15 – 20 lakhs, which puts it against the Jeep Compass. Ahead of its official Indian debut, Tata has revealed the Harrier’s feature list. Here are the top four features of the Harrier which we think you should know. Tata has designed the new Harrier on the new Impact 2.0 design philosophy. The fascia of the Harrier comes with a two-tier headlamp design with sleek LED DRLs sitting atop the bonnet and flanking the grille. Meanwhile, Xenon HID projector headlamps are placed lower on the bumper and come with auto headlamp function. Even the tail lamps get LED lighting signature which make it look more upmarket and very Land Rover-ish. The fog lamps too get LED lights. One more important feature of the Harrier is the puddle lamps projecting Harrier logo from the ORVMs. In terms of safety, the Harrier comes loaded with six airbags (including the driver, front passenger airbags, side airbags, and curtain airbags), ABS, driver and passenger seatbelt reminder, ISOFIX, cornering lamps, child lock, and lockout prevention feature. The lucrative electronic stability program (ESP) system comes with functionalities like electronic brake distribution, corner stability control, off-road ABS, traction and stability control, hill hold control, rollover mitigation, hydraulic brake assist, electronic brake pre-fill (from the Hexa), hydraulic fading compensation and dynamic wheel torque by brake feature. Similar to the exterior, the cabin of the Harrier takes its cues from the more expensive JLRs and comes with many best in class features. This includes eight-way adjustable driver seat with four-way adjustable co-driver seat. The rear seats will be 60:40 foldable with a boot space capacity of 425 litres (extended up to 810 litres with the seats folded down). There is leather upholstery with wooden inserts in the cabin, making the Harrier appear expensive on the inside. The practical cabin features usable spaces such as seat pockets, cup holders in the centre console, bottle and umbrella holders in door pads, glovebox with removable tray, sunglass holder, rear armrest with cup holders and mobile stowage in the door pads, coat and carry bag hooks, and most importantly, and cooled storage box. The centre console of the Harrier is dominated by a floating 8.8-inch high-resolution touchscreen infotainment system. The music system is a 320Watts JBL system with nine speakers which include four speakers, four tweeters and a subwoofer along with an external amplifier. The system is compatible with Android Auto and Apple Car Play and gets Tata’s ConnectNext app suite as well. Other connectivity features include USB, AUX, Bluetooth, phone and navigation mirroring with video playback and voice assist.